A new apartment building in DC just outside the Takoma Park limits. Image by Alan Zibel. 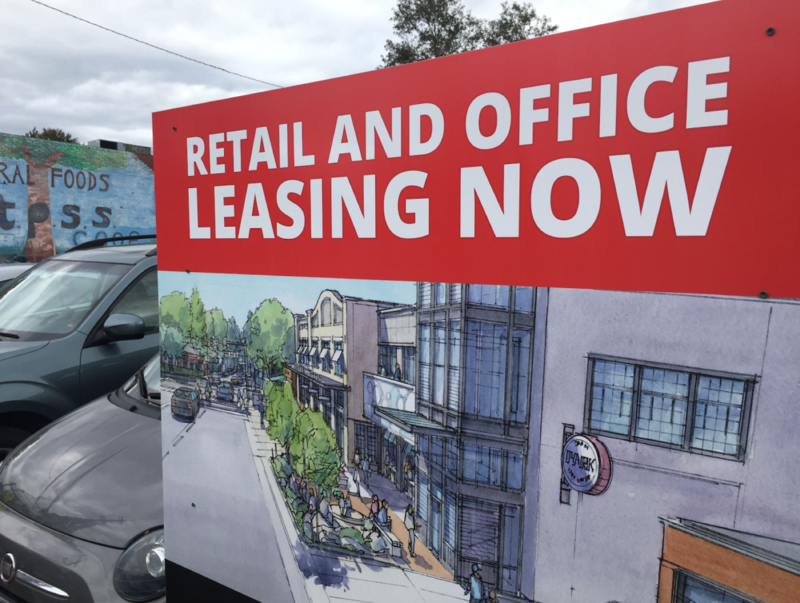 Takoma Park residents spent last summer in an anguished battle about whether the city should allow a two-story retail and office building to be built on a city-owned parking lot on the leafy city’s main street. As difficult as that debate was, the city of nearly 18,000 residents (Takoma Park is in MD right across from Takoma DC) faces a much more challenging reckoning as it grapples with how to live up to its progressive values by promoting affordable housing. This fight over the 1.4-acre Takoma Junction site took on an outsized relevance in this famously progressive, educated, and argumentative city. What started as a mundane debate about a relatively modest commercial development evolved into a gentrification “proxy war” and an intense struggle over the city’s values. A sign advertises the forthcoming Takoma Junction development. Image by Alan Zibel. Nonetheless, last month the city announced an agreement between the developer and the adjacent local food co-op on how to handle deliveries and other logistical issues before, during, and after construction. While the Junction fight is not exactly over—reviews from planning, transportation and historic preservation officials are still pending—the furor is beginning to dissipate. 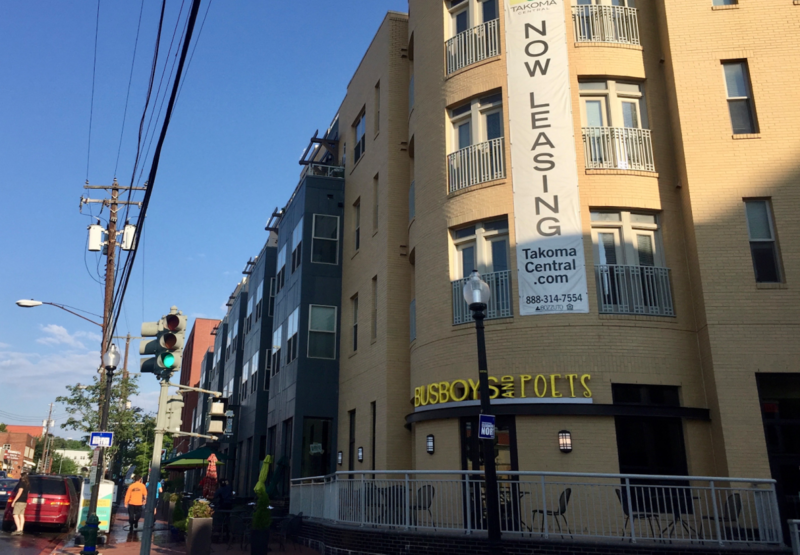 As the Takoma Junction battle fades, city officials are focusing on housing scarcity and affordability. This is a positive step. But it remains to be seen whether Takoma Park can embrace truly progressive, inclusionary land-use policies or whether it will remain mired in the status quo and face ever-increasing home prices and rents. Takoma Park has an admirable mix of single-family homes and apartment buildings, and a virtually even split between rented and owner-occupied units. This housing mix generates economic and racial diversity that is unusual for an American suburb. But the city has not seen a single new apartment building constructed within its borders since the 1970s. Only 12 new residential construction permits were issued in Takoma Park from 2012 and 2017, according to city statistics. More than 700 of the city’s affordable housing units were renovated and preserved as affordable since 2000. Over that same period, many accessory apartments in single-family homes were lost and some multi-family units were converted to condos. Unfortunately, calls to expand the supply of affordable and market rate housing with more concentrated, urban-style development are often met with intense resistance on Takoma Park’s neighborhood listservs. In these forums, 19th Century developer and city founder B.F. Gilbert’s vision of a “sylvan suburb of the National Capitol” is still gospel, and protection of the city’s tree canopy at all costs is seen as a near-sacred duty—to the irritation of some new homeowners. While more integrated than most suburbs, Takoma Park still falls short in many ways. Low-income housing is mostly segregated to the city’s periphery. Many of the city’s most disadvantaged students attend an elementary school with a high concentration of poverty, while students from upper-income families are in district at comparatively low-poverty schools. It will take courageous leadership from Takoma Park’s elected officials to push forward an agenda that recognizes that supporting new housing for people of all incomes is part and parcel of a progressive agenda. The piece about “all neighborhoods” could prove to be particularly controversial, especially in the city’s leafiest, most affluent blocks. City officials are even talking about establishing quantifiable housing targets for each ward of the city, including lower-income and higher-income areas. The Takoma Junction fight was a wake-up call for dozens of newer Takoma Park residents, many of whom hadn’t previously paid much attention to city politics. Now it’s clear that Takoma Park needs new voices to advocate for development that is inclusive and spread throughout an increasingly urban (but still green) city. There are major opportunities, as well as challenges, on the horizon. Most notably, the Washington Adventist Hospital is moving to White Oak next summer, which means a large site will be available for redevelopment. The opening of the Purple Line, currently scheduled for Fall 2022, is likely to generate interest in redeveloping the commercial areas around Long Branch and Takoma Crossroads (the intersection of New Hampshire Avenue and University Avenue), though predictions of rapid gentrification and displacement there may be exaggerated. Also on New Hampshire Avenue, the city has met with four development teams that are interested in building housing and a new recreation center on site of an aging recreation facility owned by Montgomery County. Future development site at the Takoma Park Recreation Center on New Hampshire Avenue. Image by City of Takoma Park. On the other hand, the city has missed opportunities to provide more housing. 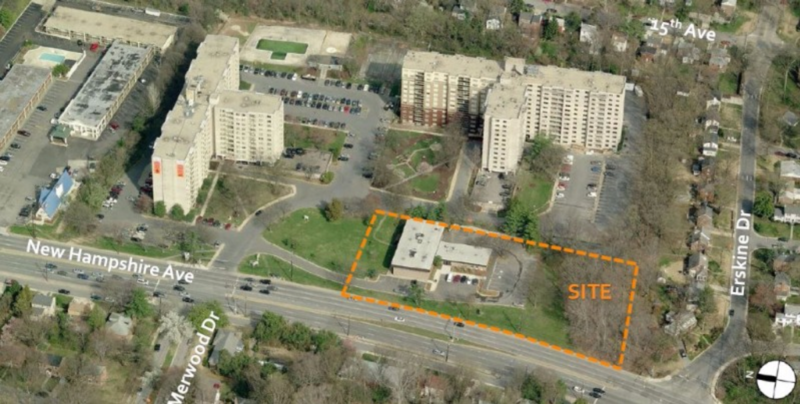 It could have pushed for a taller building with mixed-income housing at Takoma Junction. Also troubling was the city’s decision to purchase a 2.7 acre wooded lot in a neighborhood of single-family homes and to preserve the entire parcel as undeveloped open space, when some of it could have been used to build housing. Despite Takoma Park’s often-intense local politics, we should not lose sight of the fact that the city is a true gem—a walkable, vibrant, diverse city with its own traditions and plenty of local quirks. As the Washington region grows and changes with the times, so should Takoma Park. Alan Zibel and David Daddio are founding members of Takoma for All, a new group advocating for a sustainable, equitable, transit-oriented community.